If you've not yet started growing any seeds in your veg patch this year but would still love to have some yummy home grown goodies on your table this summer, don't worry. It's not too late as you can either buy small veg plants from garden centres or you can save money by growing heaps of different speedy veg from seed. 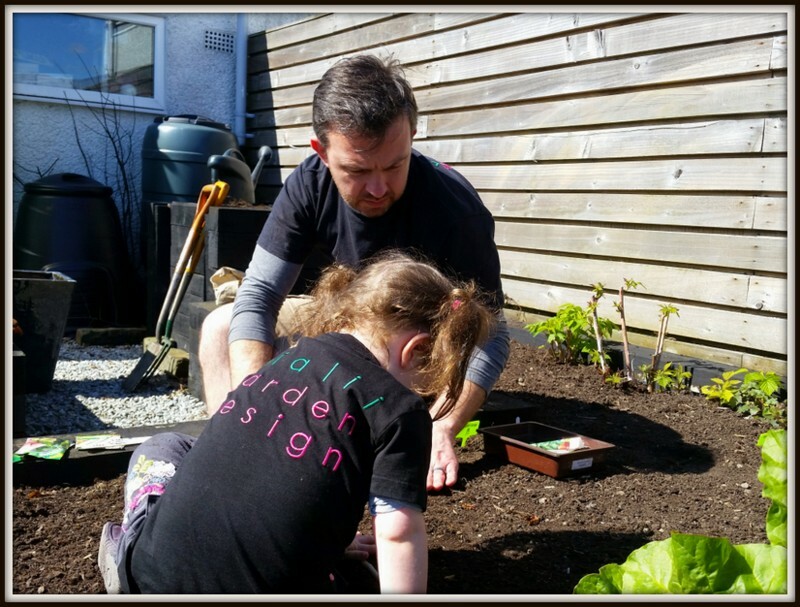 Some are fab for little 'uns like me to do all on my own but others were a bit more fiddly so I let Mummy feel all important and give me a hand. I find sticking your tongue out helps you be a better gardener! 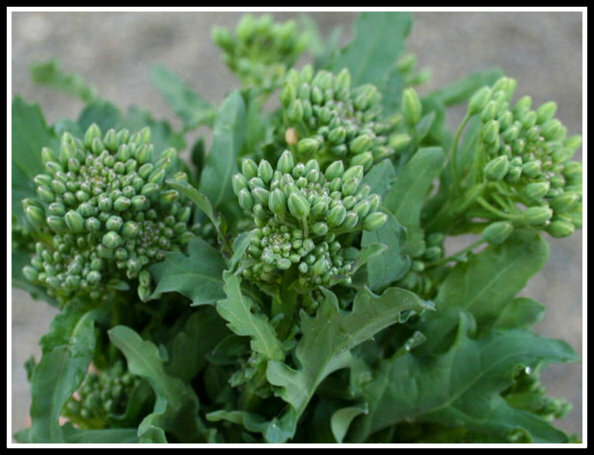 Broccoli Rabe "60 day". This isn't technically a broccoli but is a cousin of the turnip and mustard family. So it has a slight bitter taste. It's also known as turnip broccoli, rapini and rappone. All of the plant is harvested and the stem, leaves and flower buds are eaten. Don't be fooled by the 60 days in the name as it can be ready well before then and it will bolt (and go yucky tasting) almost overnight so harvest as soon as you see the flower buds form. You can store it in the fridge for up to 10 days before using. These were little seeds so Mummy only gave me a small amount in my hand at a time for sowing. Turnip- "Purple Top Milan". Just 6-10 weeks to mature but you can eat some of the leaves in salads before roots have matured. This is a good plant for growing in-between slower crops. Harvest when golf ball size to eat raw or when tennis ball size to cook. 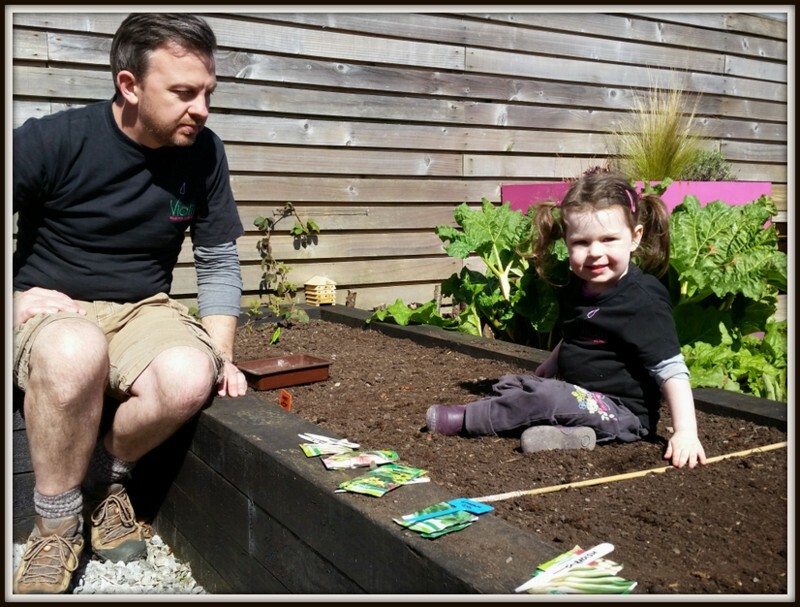 Another fiddly little seed so Mummy had to help me get these sown. Dwarf bean- "Bobis d' Albenga".These are all stripy and remind me of the beans in Jack and the Beanstalk. The plants will grow to 50cm tall so they won't win the prize for biggest thing in garden as I'm already way taller than that! They need just 9-12 weeks to grow and if you harvest them whilst no bigger than a pencil you can cook them whole, making them super easy for weaning babies and toddlers to munch on. The pods grow to about 12 cm long and they are stringless. The beans were really easy for me to handle as they're nice and chunky. 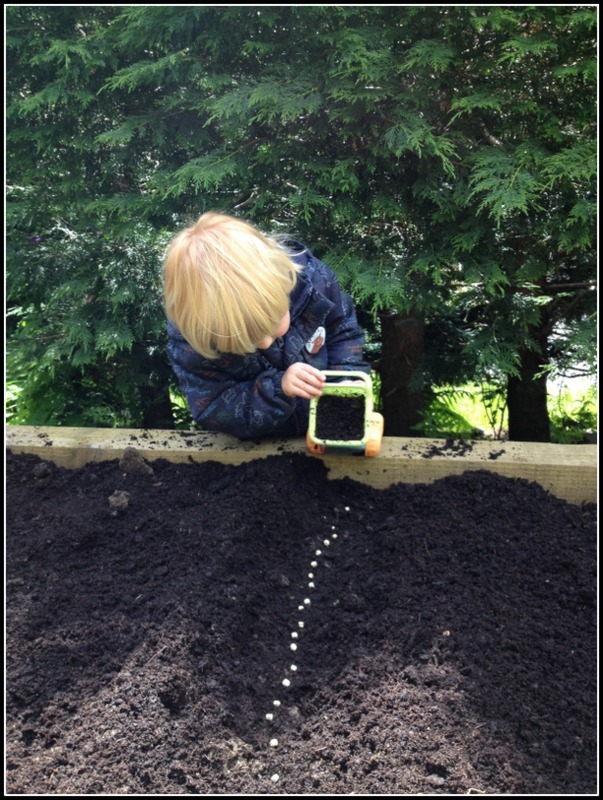 Do you think these could be magic beans like Jack's? Pea - "Kelvedon Wonder". 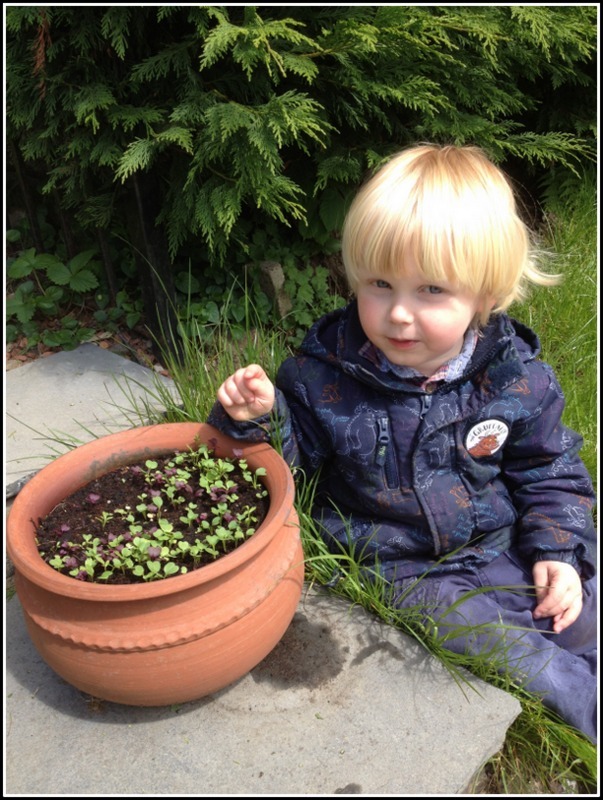 My Mummy remembers helping her Mummy harvest fresh peas from the pods a little girl and this is the first year we've tried growing any in our garden, so I have a really important job to do making sure Mummy does everything right. This variety is really good for June sowing and is ready in 12-13 weeks. Each little branch on the plant produces 2 pods so the plants should produce a really big harvest of tasty peas. It is also resistant to pea diseases such as pea wilt and downy mildew. Plant will only grow to 45 cm tall so good for smaller gardens. Cool fact- you can eat the pea flowers, shoots or vine tendrils and they all taste like young peas. 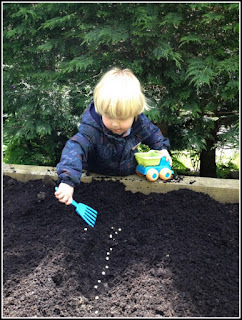 The pea seeds were also easy for me to handle and sow all on my own. Mangetout - "Shiraz". We grew these purple mangetout peas last year. They were easy to look after and they produced heaps of pods, the more we picked the more the plants produced. Pods are ready about 12 weeks after planting when the peas are just starting to form. This variety is resistant to powdery mildew and will tolerate downy mildew. 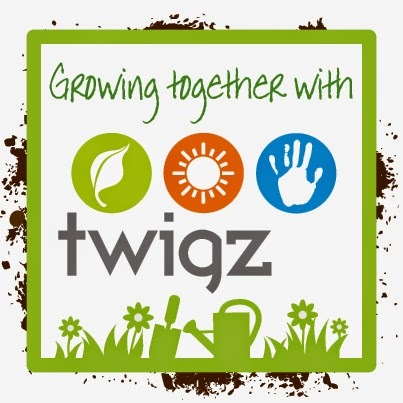 Plants grow to 1 metre tall so need supporting with canes or a trellis but they will be happy in a large pot on your patio with a cane wigwam for support. We ate them raw in salads or lightly steamed. 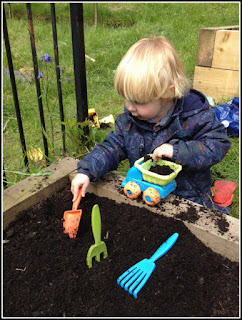 Again these were easy for me to hold and sow without help from Mummy. Salad leaves-easy peasy to grow. You can get loads of different mixes with plants such as pac choi, mustards, cresses as well as lettuces. I like the spicy, peppery ones best. These only take about 3 weeks to grow so these must be the bookie's favourite to win the growing race. simply harvest a few leaves from each plant so you can keep going back and harvest more and more. These are teeny tiny seeds so mummy just gave me a few seeds at a time that I sprinkled over our compost in a container for our patio. Last contender of all: Me, I am a growing 3.5 year old boy after all, especially when I eat all of this home grown veg!! before sowing seeds you need to remove any weeds and rake your soil to make it all nice and a fine. 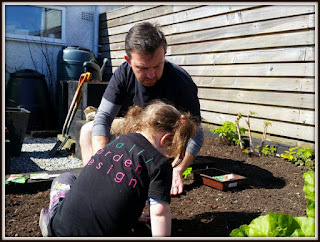 Lulu has a set of funky kids garden hand tools from Twigz which I've tried unsuccessfully to take home with me on several occasions. Mummy recently got me my own set. She said it was so I could finally "work for my dinner" but I didn't know that food could be your boss! I found them really easy to grip and work with and I love the funky colours- orange just happens to be my favourite colour at present. 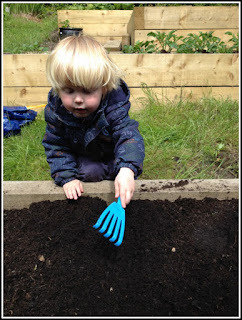 I even let Mummy have a go with them and she thought they were really study and would put up with me using them for planting and as pretend airplanes, not like the sand pit rakes and trowels I had been using in the garden. 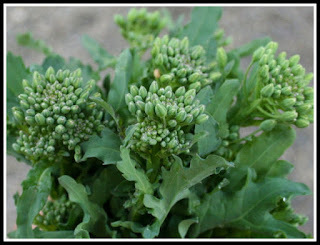 Rocket- I love space rockets AND I love peppery salad leaves so a whole container of this might yet start on our patio. Again it is really easy to grow and it only takes about 4 weeks for a crop to be ready. Pick only 1 or 2 leaves from each plant to get the longest harvest- called"cut and come again". Pinch out any flower buds when they appear to lengthen the harvest time. To stop plants bolting and becoming yucky tasting make sure to keep the ground well watered and grow bolt- resistant varieties such as "Skyrocket" which is also really fast growing-wooosh! Runner beans- They like colder weather so are perfect for Scottish gardens. If you're short on space you can even grow these in your flower borders as the plants produce lovely heart shaped leaves and pretty flowers. Also fab in containers but they do need supporting- make a wigwam out of canes. 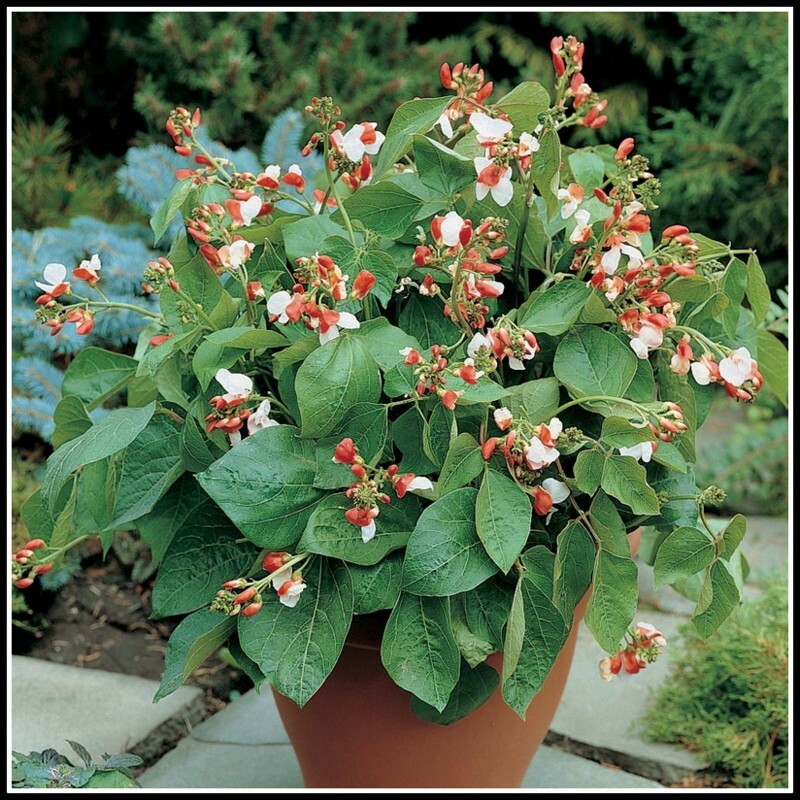 "Hestia" is a new dwarf runner bean variety. As it only grows to 45 cm tall it is great for containers and can easily be covered with a net to stop birds eating all your beans. Outdoors cucumbers- Also called ridge cucumbers. They are normally smaller than greenhouse cucumbers and have a thicker skin so they can cope with outdoor conditions. They produce male and female flowers which need to be pollinated (so don't remove any of the flowers) but hopefully you'll have loads of insects visiting your garden to do that. They crop after about 12 weeks. 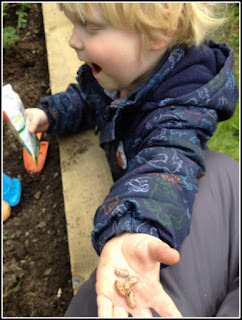 Their seeds are not too small so I could try these without Mummy's help. 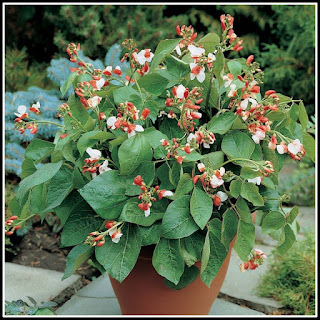 They are easy to grow in a pot supported by a wigwam made of canes tied together or if you've got the space, just leave them to sprawl over the ground. You should pitch out the main growing stem after 7 leaves have formed as that will encourage the plant to produce fruiting side shoots. 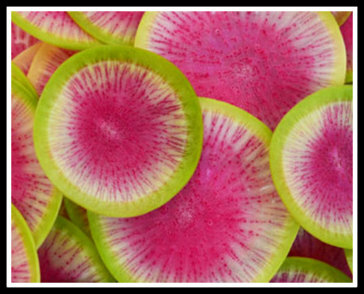 Radishes- These take only 3-4 weeks to crop but turn yucky and hard if you leave them in the ground too long so don't get carried away and sow all your seeds at the same time. Sow some every week to spread out your harvest. Like runner beans, radishes don't like too much heat so they are good for sowing in Spring and up until June. If you sow then in July you will need to be extra careful when watering- too much and their roots can split and rot, too little and they can bolt. Pick them when about 2cm in size and eat raw in your salads. You can keep them in your fridge for a week. "Sparkler" is a yummy type to try as it is reliable, easy and fast to grow. Quick update 2 months later and the first crop we got was broccoli rabe 60 days. It was yummy. Almost as yummy as the pigeons found our young pea plants! Peas now covered with a net and growing well.